The interbreed heifer championship was won by A H Wilson & Son with British Shorthorn, Cotonhall Absolute Joy, sired by Apples Absolute and bred by R Kite. Reserve went to A H Wilson & Son with Holstein, Starlet Solomon Maria, sired by Walnutlawn Solomon and bred by K Richard. The competition was judged by Blaise Tomlinson. The pinnacle of the Jersey Society’s National show was the Jersey breed championship which was won by A H Wilson & Son with Tregibby Panama Tequila, sired by Tower Vue Tequila and bred by the exhibitor. Farming at Tregibby farm, Cardigan, Hefyn Wilson was extremely pleased with the result. “I’m delighted. It’s a great honour, especially with a home bred cow.” Averaging 40 litres a day, the five year old cow was four weeks calved. Reserve also went to the Wilson family for Bluegrass Fireworks Crimson Blusher, sired by Bluegrass Festival of Fireworks and bred by B & J Daw. 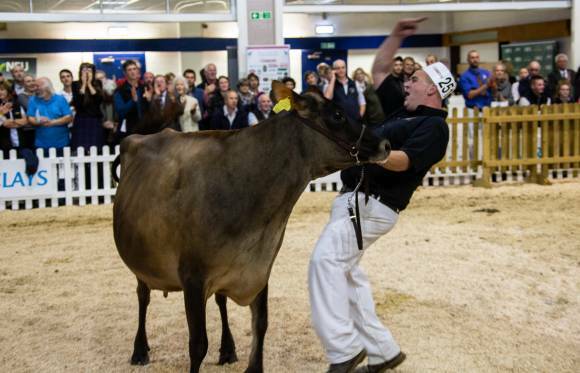 In the Guernsey Society’s National show the competition was particularly close. Judge David Mann, from St Ives, remarked that the competition had the largest amount of entries he had seen. “It’s certainly of the best quality,” he said. Taking first place was R J, J R & S M Warren, with Tredinney Conqueror Excellance 11, sired by Lew Jaonnets Cara Conqueror and bred by the exhibitor. 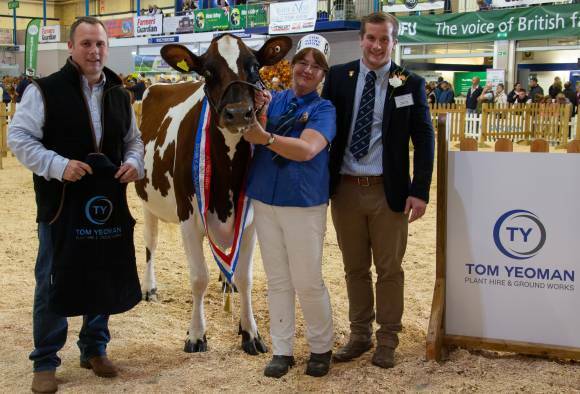 It was the only show of the year for exhibitors James and Shelley Warren, and mother, Rosemary, from Tredinney Farm, Penzance. “It’s great to win and has been a really good day,” said Mr Warren. 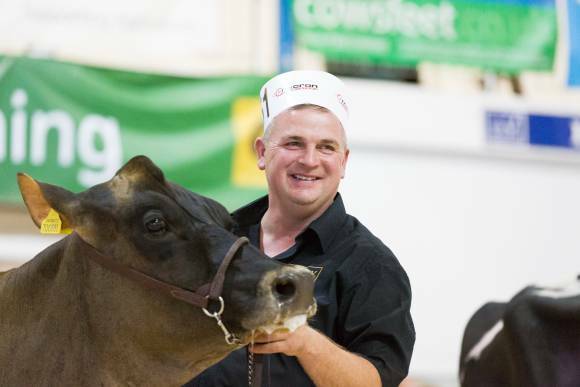 Mr Mann said of the winner: “She has really good dairy sharpness and is a tremendous animal. The family was also awarded with the Guernsey Society’s Peter Down Memorial cup, for scoring the most points across the breed competitions. 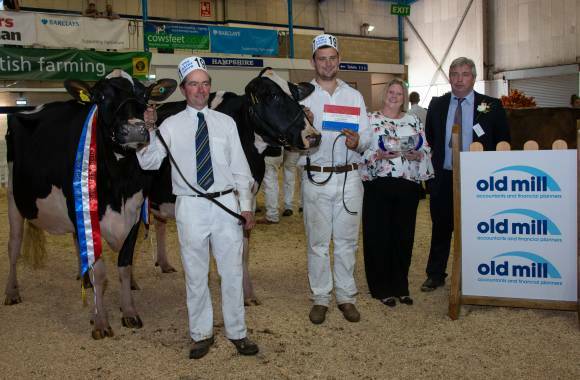 The interbreed pairs championship went to RK & SG Miller & Sons, for their Holstein pair Moorshard Pepper Marie, sired by Delarberge Pepper and Moorshard Doorman Lydia, sired by Val Bisson Doorman, with both being bred by the exhibitor. Brian Miller and Matt House led the pair around the ring and were delighted with the win, which Mr Miller had coveted for some time. 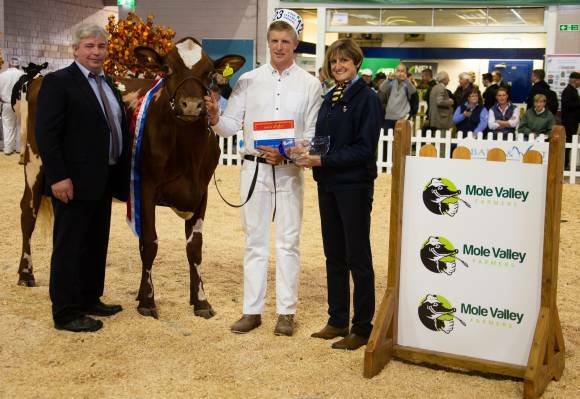 “Both cows being exhibitor bred makes it just that bit more special,” said Mr House. In reserve was a pair of Jerseys belonging to A H Wilson & Son: Bluegrass Fireworks Crimson Blusher and Tregibby Panama Tequila. The supreme championship competition saw all of the breed judges score each breed except their own and resulted in a tie-break between the reserve and honourable mention placements. As a result, Blaise Tomlinson was called upon to decide the final placing. Reserve went to A H Wilson & Son with their British Shorthorn, Cotonhall Absolute Joy, sired by Apples Absolute and bred by R Kite. The honourable mention was awarded to Brian Miller of RK & SG Miller & Sons, for his homebred Holstein, Moorshard Pepper Marie, sired by Delarberge Pepper. Brian Miller had also won the interbreed pairs championship. The dairy vet of the future competition saw four newly graduated vets compete for this prestigious award. Each entrant submitted their dissertation for assessment by a panel of judges and then took part in a 30-minute interview with the four judges. First place went to Catrin Davies from the University of Liverpool, for her dissertation on the challenges of Johne’s disease in the current economic climate. The judges commented that though the dissertation threw up more questions than it answered, it also highlighted some research that indicated there may be a way of stopping the effects of the disease. 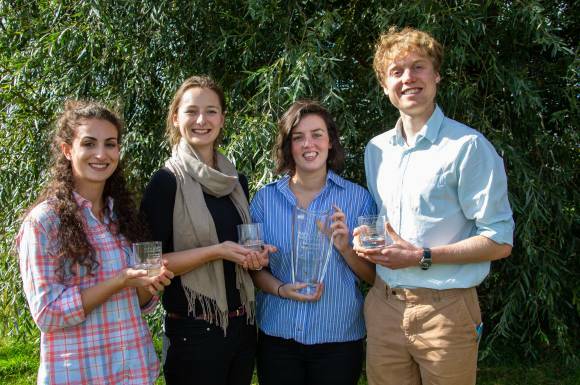 Second place was jointly awarded to the other three entrants, Holly Hills; University of Nottingham, Henry Miller; University of Cambridge and Rebecca Dodd, University of Nottingham.